Farm Apprenticeships – NOW HIRING! For anyone interested in learning about ecological agriculture, getting your hands dirty, and getting inspired about food and where it comes from, a farm apprenticeship might be a great fit for you! We are accepting applications now for positions available for the 2016 season (April – November). For more information, visit our Farm Apprentice page. Haven’t signed up yet for your CSA share? Now is your chance to get in on the flavours of the season! Sign up today for the 2015 CSA Share – the season’s first shares are coming soon! Every year, we feel so fortunate when capable, dedicated and interesting young people contact us in hopes of spending the growing season at Fiddle Foot Farm. Each apprentice brings their own unique strengths and gifts to the farm. We are forever grateful for their contributions and for what they have taught the rest of us while working and living together. Thank you Maurizio, Shannon, Kate, Max, Greg, Mike, Laina, Rob, Sarah, Emily, Melanie, Mike, Derek, Adam, Amaliya, Becky, Brad, Lana and Max (who came back this year for more)! In 2013, Emily captured some highlights of the season and gifted us with this short video tour of the farm (click the link below to watch in YouTube). Enjoy! Thank you Emily! For several years, we have been very fortunate to work with apprentices on our farm. Through the C.R.A.F.T. (Collaborative Regional Alliance for Farmer Training) network, we collaborate with other farms that host apprentices to provide a rich learning experience for those interested in pursuing ecological agriculture as a possible career. Each year, we get the opportunity to work with and watch apprentices experience the steep learning curve, joys and challenges of farming. Every apprentice brings their own unique energy and perspective to the farm and offers us great learning opportunities. The apprenticeship model, at least here in Ontario, has been a huge factor in the growth of sustainable, ecological, and organic agriculture, with many apprentices going on to start their own farm businesses and careers. Upon my arrival at Fiddle Foot on May 15th Melanie was the first of the four (Amy and Graham and the other two interns, Mike and Melanie) that I met and right at the onset of our hellos our respective gazes drifted to one another’s necklaces—both of which are made of jade and which we have both worn for the majority of our respective past year. Mine is a koru, which represents a fiddlehead unfurling into its adulthood as a fern, so it was quite perfect that this is what our first conversation centred on. Not that we were deliberately seeking to continue with the fiddlehead theme, but later that evening Melanie led me and Sacha (Amy and Graham’s dog) down to the Boyne River, to collect some fiddleheads for dinner. All this to say that after some reflection, perhaps all these fiddlehead references were what first led me to believe that which I am now certain: Fiddle Foot Farm is a wonderful fit for me. That first evening feels like months ago, but it was a mere seven weeks ago. My mind has absorbed so much, although the reality is also that there is likely a great deal that I’ve been taught that never had a chance to permeate into my memory as my mind is feeling super-saturated with new knowledge—which is a good thing, really! In seven weeks I have learned how to: milk the cows; drive a tractor; transplant copious amounts of seedlings; trellis tomatoes and peas; harvest green garlic, salad, kale, radishes and more; hand-weed and hoe; pickle garlic scapes; package CSA shares; and work at a farmers’ market. These are just a few examples. So far it seems as though the biggest learning curve, apart from the general one of perpetually doing physical work, has been working with the animals. During the first two weeks I could hear and feel my heart palpitating when I had to step near the rooster (he sometimes attacks us, although really just Mike and I seem to be the targets) but now, at least with my makeshift shield (a plastic bin) in hand, I have very little qualms with my ability to approach the rooster. 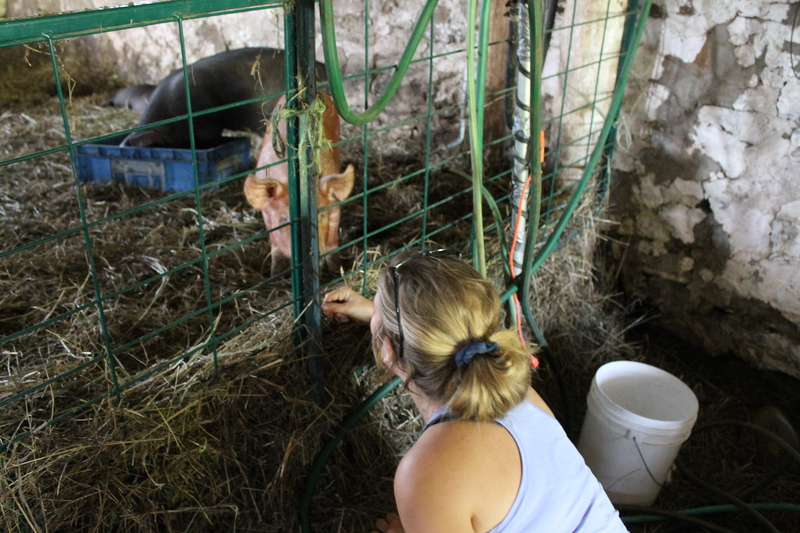 From the perspective of the CSA Member and Market-Goer the animals may not seem like a big part of the farm, but they in fact provide us with manure, lawn mowing of pastures, milk and eggs for home-consumption, and endless joys and challenges. Other challenges that persist seem to be efficiency with the time that we have as well as carefully listening to verbal directions throughout the day. Hopefully I will never again make the mistake of planting 2 rows of peppers, only to discover that we need 3 rows in the same space, and to yet further discover that the second planting was done too close and that a third attempt would be required. Oh and if you happen to come by the farm in the next couple of days you may notice a pond-like depression in one of the gardens… I need to revisit my digging-with-the-tractor skills. The challenges, however, really are not in the foreground of my experience at Fiddle Foot. In fact, somehow they end up feeling rather inconsequential amidst the ephemeral wonder of garlic scapes, the glowing (thanks to Melanie for using this description) nature of the rainbow chard, the tenderness of the calves’ affection, the goofiness of Floppy the pig, the allure of a bird nesting in a enormous thistle, the beauty of the fireflies along the periphery of the property, and the hearty laughing that occurs daily during the conversations had by the five of us on the farm. I have learned about fishing, sustainable agriculture from the perspective of his program at Sir Sandford Fleming, punctuality (how do you always get to the house before us in the mornings!? ), and the plot of and quotations from several semi-obscure TV shows and movies. From Melanie I have learned about holistic nutrition, yoga, cooking techniques, the meaning of a real-life doppelganger, and confidence around the cows and pigs. The combination of the people, the animals and the land means that every day provides a new lesson, a new discovery and something new to laugh about.